My dad being the GREATEST dad and all, we did a little bit of celebrating him this weekend. At first, I was all confused. I thought we got to celebrate ME since I am the reason he is a dad. Yep, imagine my surprise when I realized all the treats were for HIM and not for MOI. But once I got over myself, I did the next best thing ... I ripped into helped him open his presents. I think it is safe to say we both had alot of fun with the whole gift thing!!! How great you could help to open all the presents! 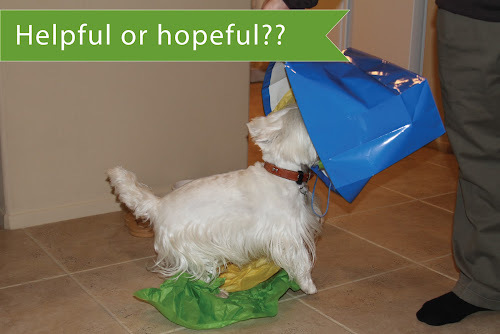 Aren't ALL pressies for us doggies, Duncan? We sure think so! What, it isn't all about you?